Francis 'Frank' Barber was born, possibly in 1735 (or later, in the early 1740s), in St. Mary, Jamaica: he was a slave belonging, by 1750, to Richard Bathurst, of Orange River Estate. In 1750 Bathurst took Frank with him to Britain, to join his son, also Richard, a doctor in London, and a close friend of Dr Samuel Johnson, the writer and great lexicographer. Frank was sent to a school at Barton in Yorkshire for about a year, then went to live in Dr Johnson's household in 1752. When Bathurst senior died in 1754 in his will he gave Frank Barber his freedom and 12 pounds sterling. Apart from two brief episodes when he went off on his own, Frank Barber lived with Dr Johnson until the great man's death in 1784. During that period he was 'servant, companion and surrogate son to Johnson' as one writer puts it. There was clearly a great relationship between the two men; Johnson pulled strings to get Frank out of the Navy after he ran away to sea, paid for his schooling at the Bishop Stortford Grammar School in the late 1760s and took Frank's growing family into his home. Frank cared for Dr Johnson in almost every way, as valet and secretary, and nursed him in his various illnesses, taking communion with him when he received it for the last time just before his death. In 1773 Barber married a young English girl, Elizabeth Ball, in the local parish church of St Dunstan's in the West. The couple eventually had five children, apparently after some miscarriages, but of these only three survived infancy; mortality rates among children were very high in the 18th century, especially in the unhealthy cities. 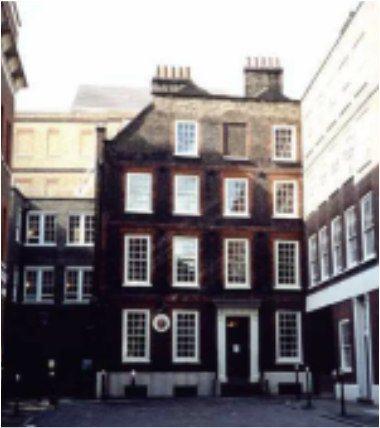 When Johnson died in 1784 he left the bulk of his money and possessions to Frank Barber; this guaranteed him an income of ￡70 a year, but over the years the Barbers had to sell most of the items Johnson had left them in order to make ends meet. Johnson's friends, especially Reynolds and Boswell, helped the Barbers also. They moved to Lichfield in 1786, as Johnson had advised, and set up home there; later, in the mid-1790s, they moved to the nearby village of Burntwood, where they started a school. Francis Barber died in the Stafford Infirmary in 1801, and his wife, Elizabeth, who moved back to London with their surviving daughter Ann, died in 1816. Their surviving son, Samuel (1775 - 1828), on whose education they had spent time and money, became a minister in the Primitive Methodist movement, and was well-known in the Stafford region, where direct descendants of Francis Barber still live. "Samuel Johnson's Jamaican connections," Prof. John Ingledew, Caribbean Quarterly, vol 30, no 2, 1984. The 'Portrait of a Black Man' by Sir Joshua Reynolds used on this page has been traditionally identified as a portrait of Francis Barber.